Masao Maruyama was the most influential and respected political thinker in post-WWII Japan. He believed that the collective mentality, inherent in the traditional Japanese way of thinking, was a key reason for the defeat in WWII and was convinced that such thought needed to be modernized. 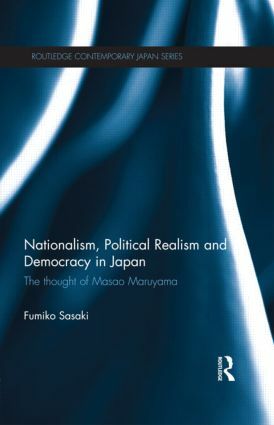 In this book Fumiko Sasaki argues that the cause of the prolonged political, economic and social decline in Japan since the early 1990s can be explained by the same characteristics Maruyama identified after 1945. Using Maruyama’s thought Sasaki explores how the Japanese people see their role in their nation, the democracy imposed by the US, and the relationship between power and international relations. Further, Sasaki also considers what the essence of national security is and how much it has been forgotten in current Japanese political thought. The book solves the puzzle of how Maruyama, a teacher of political realism who emphasized the importance of power, could insist on the policy of unarmed neutrality for Japan's national security, and in doing so, illuminates how traditional Japanese thought has impacted development in Japan. Despite his status within Japan, there are few English language books available on Maruyama and his thought on national security. This book therefore will be an essential resource for students and scholars of Japanese Politics and Political Thought. Fumiko Sasaki is a Professor in International Relations and Global Studies.